After my post the other day about my love affair with lardo, I was contacted on Twitter by Michael Ruhlman. He asked me if I had heard about #charcutepalooza. I hadn’t but was intrigued. The word itself made my mouth water. I had visions of a 3-day festival of salumi, pate, and bacon, all culminating with a performance by the original line-up of Jane’s Addiction. I was disappointment to find out that #charcutepalooza is not an actual physical event (Note to self: plan a 3-day cured meats / 90’s alternative music festival). After a bit of research, my disappointment faded and my eyes widened as I found out what it actually was. Charcutepalooza is the brainchild of two food bloggers; The Yummy Mummy and Mrs. Wheelbarrow. The subtitle is “The Year of Meat”. Their idea was to create a community where food-minded people could take a year to explore the art of charcuterie, while “celebrating the appropriate, thoughtful consumption of meat”. What’s even better is that they are using Ruhlman’s Charcuterie book as the road map for their journey. The full details can be found here, but the basics are on the 15th of every month, a new charcuterie challenge will be posted (last month’s was duck prosciutto). Bloggers will then create their dry-cured masterpieces and blog about how they were used in meals. Obviously I signed up right away. As I pointed out in my last post, Ruhlman’s book was given to me as a gift a few years back and I quickly became obsessed with it. I was always interested in finding out how things were made and I really had NO CLUE why bacon tasted like bacon while pork chops tasted completely different. I found that by taking the hands on approach and actually making bacon or prosciutto or sausage, not only did I learn a lot about the foods’ origins, but I also learned a lot more about what characteristics different cuts and different animals possessed. That lead to a real appreciation of the animal and where it comes from. We’ve all heard the stories of the factory farms that produce assembly line hormone injected meat. Charcuterie (both the book and the art) lead me down the path to finding better, more sustainable sources for the meat that I consume. I am totally excited about Charcutepalooza. I’ll keep you posted on what food challenges are coming down the pike. 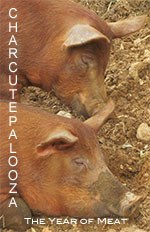 You can follow along on http://www.facebook.com/charcutepalooza , or on twitter (#charcutepalooza). Also, if you have any questions about my experiences in charcuterie, let me know. Everyone should make their own bacon at least once in their life!